Citrus County’s relay participants will meet at the Sheriff’s Crystal River Community Resource Office on U.S. Highway 19, where the run will start at 8 a.m. The nearly 3 mile run will start at the Crystal River Substation, located at 123 NE Highway 19, and end at the Publix in Crystal River, 6760 W Gulf to Lake Hwy, in the Crystal Springs Shopping Center. Bicyclists will ride the second leg of the cross-county relay from there to the Inverness Publix located at 1012 W Main Street, about a 14-mile stretch. From that point, runners will complete the relay leg with a one-mile jog to the Sheriff’s Operations Center in downtown Inverness for lunch and photos. 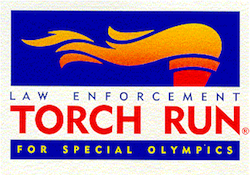 The Torch Run is the largest fund-raiser and public awareness event in Citrus County for the Florida Special Olympics. By supporting the Special Olympics, you help individuals with developmental disabilities lead a more productive and independent life. If you are interested in supporting the Torch Run, please contact Citrus County Lieutenant Troy Hess via email at thess@sheriffcitrus.org. For more information on the Florida Special Olympics, please visit their website at SpecialOlympicsFlorida.org.